A while ago we did a liturgical chorale tutorial (back in the beginner stages of this channel), so definitely check that out if you feel like this Grade 3 level piece is a little much for you at this point. We’re going to take a look at how to play this piece, discuss the backstory and key details of it, and I’ll give you some practice tips. This is the first Tchaikovsky piece on the channel, and I’m really excited to dig into his work. Let’s get started! “Morning Prayer” is from Tchaikovsky’s Children’s Album, op. 39, and was inspired by Robert Schumann’s similar collection of pieces for children (Album for the Young). We recently did a grade 3 level tutorial for a piece from Schumann’s album, so check that out if you missed it. This collection has 24 pieces and was composed in 1878. If you played all of the short pieces in this album start to finish, it would only take you about 30 minutes. Like Schumann, Tchaikovsky thought that there wasn’t much in the way of good children’s music for piano, so he decided to write his own collection. Some of the pieces are named after nationalities (“Italian Song”, “French Song”), some are named after dances (“Mazurka” and “Waltz”), while others have expressive titles like “The Sick Doll”. These pieces vary in difficulty from early intermediate to advanced intermediate. 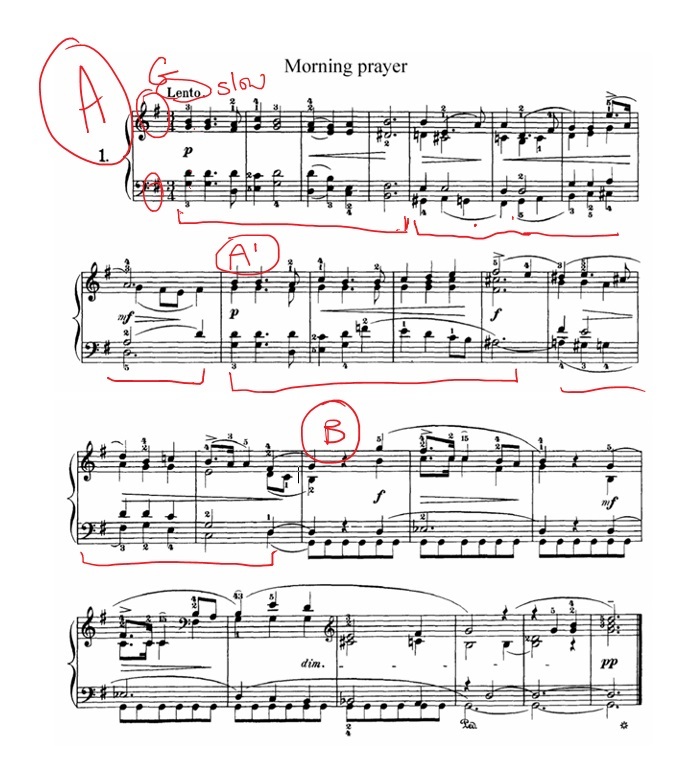 Morning Prayer is one of the easier pieces in this collection – though it’s actually rather difficult for a grade 3 piece. You can find the album for free to download here. The first thing we need to discuss in Morning Prayer is written in the style of a liturgical chorale. This a German protestant style of music, which is sung during the liturgy. 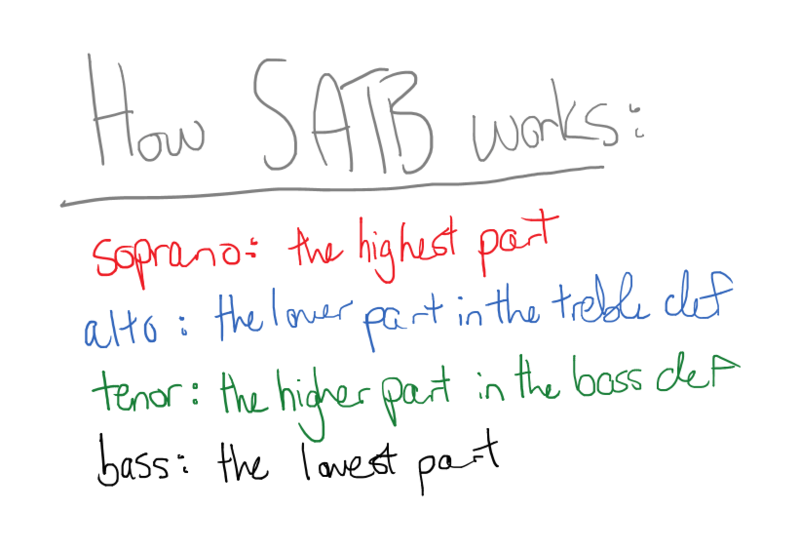 It’s written in SATB form (soprano, alto, tenor, bass), which means that there are four lines of music in constant harmony. The soprano carries the melody, and the other voices support it (harmony). Sometimes piano composers take the chorale form and apply it to their pieces. There are tons of examples of this, but today we’re focusing in on Tchaikovsky’s Morning Prayer version. Every now and then you’ll see the harmony moves from 4 voices to 3 – that just means that two parts are singing the same note. So when we translate this to piano, it means that we want to play it smooth and expressive, to imitate the human voice. 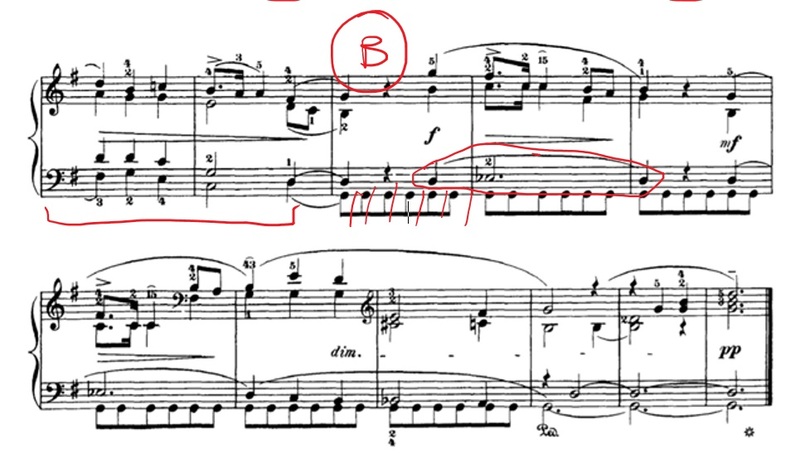 We also want to emphasize the soprano (top) part, since it’s the melody. Okay, so let’s talk some basic details about this piece. First, what key is it in? Well if you see the F# floating in the key signature, and think about what scale has an F#, you should come up with the answer G. This piece is in the key of G major. Next, time signature. ¾, which can add a slight challenge to those of us used to the rhythm of 4/4. The tempo is lento, which means slow. That’s good news, since there’s so much movement in this piece. Looking through, you’ll see that this chorale is neatly divided in 4-bar segments – at the end of each 4-bar segment, there appears to be a cadence or a sentence end. This is something to keep in mind as you’re learning the piece – it’s much easier to work in 4-bar phrases than to play through the whole thing each and every time. Finally, the form. I would label this “A, A1, B” because there are three distinct parts. The first two parts start exactly the same, but diverge. The ‘B’ section is when the bass note starts playing a low, repeated note. So now that we’ve got all the basics covered, let’s talk about how to project that soprano melody. Our aim in this piece is to keep things as smooth and natural-sounding as much as possible, so it has a life-like, sung quality to it. This includes the melody. Sometimes when people are learning how to bring out a melody, their hands tense up and things get very clunky. Try to stay relaxed for a more natural sound. I would learn this by playing the soprano voice all on its own, so you can train your ear to it. Once you’ve got the melody figured out, add the alto part to the right hand. Concentrate on projecting the upper notes while staying relaxed. One thing to keep in mind is that for the most part, your RH inner fingers (1 and 2) are going to be the quiet ones, and 3-4-5 are generally going to be the fingers playing the melody. Finally, when you’re comfortable playing the right hand, add in the left hand part as well, keeping it a little quieter than the RH so everything sounds balanced. Before I leave you to practice this piece, I have a couple more practice suggestions for you. So we’re already addressed the first problem. For the second problem, a tendency is to press the notes non-simultaneously, so they don’t all make their sound at the same time. This gives us a harp-like roll effect that we really don’t want (for this style of piece, anyway). What we really want to do is make sure every note is sounding all at the same time. So when you’re playing, be sure that your fingers are fully set up and in place before you press down. This might mean playing a little slower, but that’s fine because this is a slow piece. Set up your fingers, then press. Set up your fingers again, then press. Don’t just slide over the keys and press down before your fingers are really ready. One final note is for the tenor and bass parts in the B section of this piece. You’ll notice that the tenor part has these smooth slurs, while the bass notes are repetitive and a little choppy. The temptation is going to be to play the top LH note (the tenor) in a choppy way, just like the bass part. You need to split your brain so that your lowest notes don’t impede the flow of the tenor notes. This’ll take a little practice – spend all the time you need working on the left hand part alone. Make sure you’ve really got the technique down before putting it hands together, or else you’ll get a sloppy result. I hope you enjoyed this grade 3 level tutorial! As I mentioned earlier, it’s actually quite a difficult piece for the level, so allow yourself ample time to learn through it.